It's been a while since we've done one of these multi-page Minimate reviews, but in honor of this being #300, and the fact that I am legitimately so excited about this series, it seemed like a good time to go nuts. A product of MI-6's ninja program, Colin King went into the family business and became a freelance spy, with advanced combat skills and even more advanced weaponry. Let that sink in a moment: MI-6's ninja program. The British government has a ninja program. I guess it was the only way for them to counter the CIA's samurai initiative. 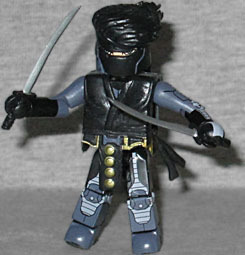 The original Ninjak was created in 1993 by writer Mark Moretti and a little-known artist named Joe Quesada. This is the 2012 version, though. His costume is purple, black and gray, which comes straight from the old design, and he gets a fancy new chest cap to represent his vest and loincloth. He's armed with two swords, and the scabbards can plug into his back (they're meant to be crossed, per the art, but the Minimate can't manage that). Ninjak's mask leaves his eyes and his hair exposed, but covers his mouth - kind of hard for an artist to portray emotion that way. It's a removable piece, and the set includes an extra piece of hair to replace it. He's got a smirk on his civilian face, and there's a fully detailed chest underneath his vest, should you choose to remove that as well. The original Shadowman had "the door to his soul" opened, which gave him superhuman abilities when the sun was down. The new version is part of a familial legacy. That's the big difference between them. The modern costume is black with grey boots, belt, and gloves, and the white Shadowman symbol (representing a dark figure walking through a lighted door) is off-center on his chest. He comes with two accessories, though one is just the fully extended version of the other: it's the Sengese blade, based on the weapons used in dances and rituals in West Africa. '90s Shadowman wore a blue Mardi Gras mask he found in the gutter. Modern Shadowman has a mask that appears to be about as thick as a coat of facepaint. 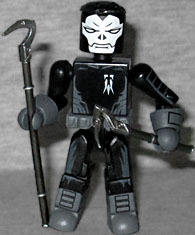 There's a stylish white skull pattern, and his hair sticks out the top of the mask. If you prefer a more human look, the set includes a second head and hair, though his skin seems more grey than brown. And his hair gets much bigger! This entry was posted in Art Asylum, MMMR and tagged Battle Beasts, Minimates, Valiant. Bookmark the permalink. Another casualty of TRU deciding which of its stores are "eligible" to carry items. The best, deal, currently, is at ToysRUs.com, where these sets are $3.98 apiece with free shipping on $19+. All four sets, plus one of the two Muppets Minimates sets at $3.98, and you're shipped.